ViewSonic VA1912WB is a 19″ widescreen LCD with 16:10 wide-screen aspect ratio and ViewSonic Dynamic Structure technology accelerates video response for better video quality. Other specification include ClearMotiv fast 8ms video response, 300 nits of brightness, 500:1 contrast ratio, and 1440×900 optimum resolution which is perfect ideal match with Apple new MacBook Pro. 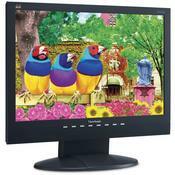 Sci-Tech Today reviewed ViewSonic VA1912WB and gave rating of 4 out of 5. Conclusion is that the ViewSonic VA1912WB can be a good choice for the right computer. The tilt screen, integrated stereo speakers, and digital circuitry provide the latest technology. If you are upgrading to a larger monitor or want to experience widescreen computing, this model is certainly worth checking out. Pros: Three-year warranty on parts, labor, and backlight; built-in speakers offer solid sound; includes DVI-D and VGA ports and cables; tilt design. Cons: Odd native resolution; low pixel pitch makes for a somewhat grainy display; speaker maximum volume too low.